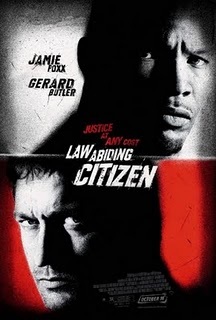 In what could be the most hyperbolic title of the year, Law Abiding Citizen takes into account a couple of things: the length a man will go after losing his wife and child and our corrupt legal system that lets murderers go free. Neither are handled with much care or provide us with any insight that hasn't already previously been tapped into by countless other revenge pictures. The only thing separating this one apart is that the poor soul who watches his family get murdered decides that blame should also be placed on the people involved with the criminal case, including the district attorney and judge who presided over it, which could be the most flawed, illogical train of thought any pissed off widower could possibly have, especially given the circumstances. More on that later. The film opens under peaceful conditions in Clyde Shelton's (Gerard Butler) house with his wife and child. When the doorbell rings, he opens the door only to have his face smashed in with a bat. The next thing he knows, he is bound and gagged and watching his wife and child die from the hands of two evil men who are eventually caught and put on trial. Nick Rice (Jamie Foxx) is the prosecutor and is doing his best to put the men away for good. However, the evidence is not sufficient enough to keep both men in jail. He explains to Clyde that if brought to trial, there is a distinct chance they could lose, resulting in both men going free. The deal he makes instead is for one man to get the death penalty while another gets five years in jail. Flash forward ten years later and the execution day is upon us, but something goes wrong and the criminal suffers great pain before dying. Just as well, the other man, who is now free, goes missing before being found in pieces in an abandoned warehouse. Clyde is then arrested and admits guilt to both murders, but vows to take out everybody involved with the case and somehow keeps killing people, even while he is locked away in his cell. The logic in this whole predicament is absolutely absurd. In other revenge movies, the protagonist is angry because the guilty men are let completely free or get a very limited time in jail. In Law Abiding Citizen, the men are punished, one severely and the other not so much, but the fact is that justice was served. Given the circumstances, with corrupted DNA and insufficient evidence, nabbing one of the two is pretty damn good, especially considering the lucky guy still does a good amount of time in jail. Does Clyde have a right to be angry? Of course he does, but the fact of the matter is that Nick, being an informed and learned lawyer, made the best possible decision he could with the many factors surrounding the case. But the movie tries to make us question that decision asking, did he really do all that he could? Well, movie, yes he did, at least according to the information you presented me with. Still, the murder of the one man left standing is understandable. Besides, what man wouldn't want to get revenge for the brutal killings of his wife and child? But why take out the people involved with the case as well? They did, after all, give one man the death penalty, handing out as much punishment as they could under the legal proceedings. This is when the movie gets a little too ridiculous for its own good. The problem with the overall tone of Law Abiding Citizen is that the murder and torture are played as lighthearted, even whimsically at times, and it is repugnant. Did the freed murderer deserve more punishment? Yes, of course he did, but still, there is nothing funny about what Clyde did to him. Like this year's remake of Last House on the Left, this movie relishes in pain and misery and it is difficult to watch. There is a depressing air about it where gruesome torture and mean spirited actions abound. For example, Clyde records himself torturing the murderer and then sends the tape to Nick's family. It is then viewed by his daughter, which serves no purpose other to repulse us. Reaction achieved. Many people in my screening were laughing, but if any laughs are produced within this movie, they are unintentional because Clyde's uncaring mannerisms are an inclination of his apparent psychosis, which is nothing to laugh about. If anything, it should have been disturbing and unsettling, but ends up coming across as merely stupid. With that said, there are some flashes of brilliance, including a great court scene where Clyde defends himself and spouts legal mumbo jumbo, citing court precedents and convincing the judge to let him go. He then abruptly flips his words and explains that the corrupt court system is the reason they are there to begin with. If they had given both men who murdered his family the death penalty, he wouldn't be there today. This was wonderfully written, well acted and showed a hint of inspiration, but it all came crashing down rather quickly. The problem with Clyde's huge overarching plan is that everything would have to go perfectly for it to be pulled off. If one person calls in sick or calls a cab instead of hopping in that car wired with a bomb or doesn't pick up the phone that is triggered with a trap, his plans are botched. The final twist casually rectifies these shortcomings in some instances, but its ludicrousness knows no bounds. So many factors would have to fall into place--negligent prison guards, inept FBI agents, luck, perfect timing, and more--for it to happen anyway that the explanation of prior events ends up meaning nothing. Law Abiding Citizen isn't nearly as intelligent as its bloated ego would have you believe.